Percy Heath has been an unassuming advocate of the finest jazz art for seven decades. Barrie Kolstein pays tribute to a master. He is a quintessential soloist and a perfect accompanist. In short, he is the bassist’s bassist. The eldest of the three jazz-playing Heath Brothers, Percy Heath has been keeping time with some of the century’s greatest musicians for almost 70 years, the last 30 of them as a key member of the Modem Jazz Quartet. Born on 30 April 1923 in Wilmington, North Carolina, and brought up in Philadelphia, Heath started his musical career as a violinist and vocalist. Music imbued every aspect of family life: his father, Percy Sr, was an accomplished clarinetist who performed with the local Elks lodge band and rubbed elbows with such greats as blues saxophonist Louis Jordan; his mother, Arelethia, was a well-established singer with a background in Baptist gospel music. ‘My mother and grandmother were members of the 19th Street Baptist Church Choir,’ Heath recalls. ‘We had a gospel quartet consisting of my mother, grandmother, a female cousin and myself. We performed at Baptist Church teas and jubilee festivals as The Family Four. It was his father who gave him a violin to study. The son was unimpressed – ‘It squeaked too much, he jests – but attained a level of proficiency on the instrument to guarantee a place in the first violin section of his school orchestra. It wasn’t long before Heath fell in love with the double bass in the ensemble and found himself musically driven in that direction. He was determined to pursue a career in music, but global events in the shape of World War II were about to disrupt his life. Heath did his duty, joining the US Air Force and seeing active service in Europe. He became a pilot of P40 War Hawks and P47 Thunderbolts, rising to the rank of second lieutenant flight pilot in 1945 – no mean accomplishment for an African American in the U S military of that era. Such exposure guaranteed Heath national recognition and he was rewarded with the privileged position of house bassist for both Prestige and Blue Note Records, the foremost jazz recording labels of the day. It coincided with an invitation to join Dizzie Gillespie’s big band, of which Heath’s brother Jimmy was also a member. It would prove to be one of his most rewarding and longstanding musical involvements. The group became the Gillespie Sextet – comprising Jimmy Heath, John Coltrane, Charles ‘Specs’ Wright, Milt Jackson and Percy-in 1950. Shortly afterwards, Milt Jackson put together the Milt Jackson Quartet for a limited period, featuring himself on vibraharp, pianist John Lewis, drummer Kenny Clark and Heath on bass. One consequence was the legendary album Softly in the Morning (on the Hi-Lo label). The group evolved into the even more legendary MJQ, the Modem Jazz Quartet, in 1952. The only line-up change occurred when Clark was replaced by Connie Kay. Kay remained until his death on 30 November 1994. With his colleagues in the MJQ, Heath created a distinctive new jazz style and sound, one which has proved timeless thanks to the 56 records in the ensemble’s discography to date and the wide range of audiences for which it performs. Its artistic remit is spectrographic from performing numerous orchestrations of the genius of John Lewis for orchestra and the Quartet, to executing soundtracks. As Whitney Balliett, the New Yorker magazine’s influential jazz critic, put it, ‘the MJQ has unimpeachable taste and self-charging musical imagination’. In 1974, the MJQ disbanded and Heath took advantage of his new-found time to work with his brothers Jimmy on saxophone and Albert Tootie’ Heath on drams. The Heath siblings have produced one of the most extraordinary family collaborations in musical history and one that is unparalleled in their chosen musical field. Meanwhile the MJQ had reformed (in 1987) and has been together ever since with Heath back on bass. In 1995, he undertook a 20-city tour of the Far East with the group, followed by a two-week, 15-city tour of Europe. The MJQ recently released two highly acclaimed CD sets: the first, Dedicated to Connie; and a well regarded 40th anniversary box. The latest recording is MJQ: A Celebration, and features guest artists such as saxophonists Illinois Jacquet, Branford Marsalis and Phil Woods, Bobby McFerrin on vocals, and Wynton Marsalis on trumpet. Just how significant Heath’s contribution to jazz has been and remains is reflected in the 200-plus record albums on which he features, many of them with the leading jazz artists of the century. He has performed on many occasions in the White House for numerous incumbent Presidents and visiting international dignitaries. He is a founding performer at the Kennedy Center in Washington. The French government recognized his achievements in 1988 when it bestowed on him its Cross of Officer of Arts and Letters. A year later, Heath was awarded an honorary doctorate from the Berkeley School of Music in Boston, and in 1995 the Thelonius Monk Institute named him the recipient of its prestigious Marra Fisher Award. In 1997, he received the prestigious Louis Armstrong Award for excellence in the world of jazz. Heath, however, remains unassuming and ever modest about such accolades. He is quick to single out his parents, his brothers and Miles Davis as important influences on his life, but says his greatest muse and inspiration has been his wife June. They’ve been together for more than 50 years – they met in Philadelphia in 1947 and married in New York on March 31 1950 – and have three sons. Heath and June live in the artistic community of Eastern Long Island, New York, where the gentleman, when not performing or recording, can follow his other passions, known as ‘the two Fs.. .fishing and fiddling.’ Not content with being one of the most productive jazz bassists in history, Percy is also a champion angler! 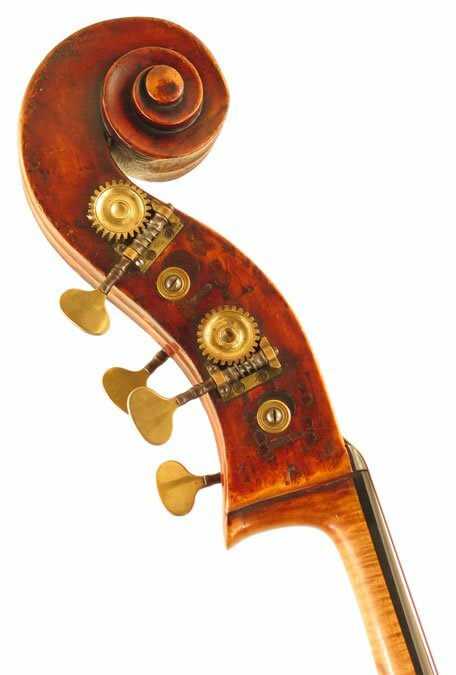 Percy Heath owns just one bass: a magnificent Pietro Giacomo Rogeri instrument made c.1699 in Cremona, Italy. It is a modified seven-eighth size, gamba shaped, roundback model bass violin. The top table is a six-piece sectional plate of vertical grained spruce ranging in grain from fine to medium. The back table is a two-piece sectional plate of slab-cut poplar. The ribs are of slab-cut poplar matching the back table. The scroll is original, made of poplar with a highly flamed maple neck graft. The individual brass tuning gears, two to a cheek, were fitted when the instrument was converted from a three- to a four-string bass, most probably in the 19th century. It is set up for the modern school of steel string playing with a tension-compensating raised saddle with a Kolstein adjustable bridge. The varnish is a magnificent light-brown amber. 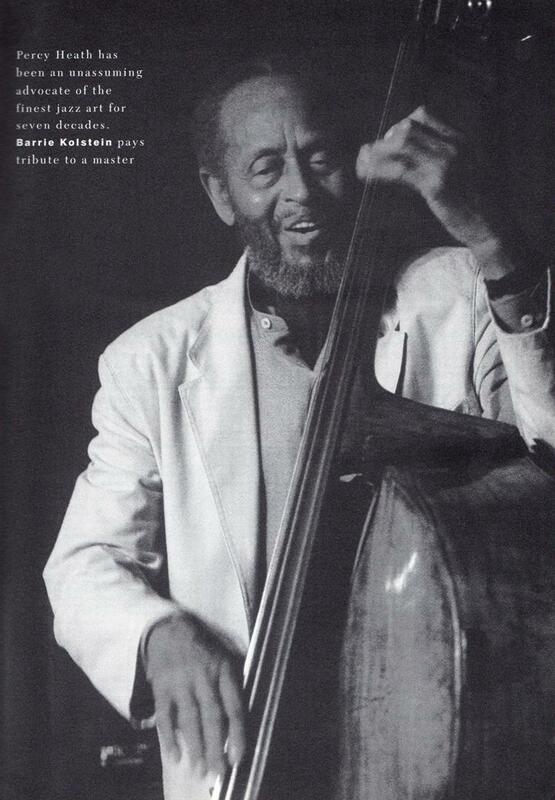 Heath also plays a Kay Ray Brown-model, violoncello which he tunes in fourths (bass tuning).